The U.S. Dollar is getting more expensive against the Russian Ruble again as the Russian currency is feeling pressure from the new round of the Western sanctions. Crude oil seems to have stop saving the day for the Russian economy and national currency. Amid new sanctions against Russia, international investors have been losing interest in Russian assets for a while. Even the negative correlation between crude oil and the Russian Ruble seen over the last few weeks can confirm that. While Brent oil was rallying to set a new 24-month high, the Russian Rubble was going to opposite way against the U.S. Dollar. NordFX experts report that the USD/RUB exchange rate is now well above 59. Moreover, the Russian currency is probably going to face really tough challenges further down the road, the experts warn. Even though the Russian government has been trying really hard to prevent the Ruble from going down against the U.S. Dollar and other major currencies out there, the current economic and financial situation in Russia leaves much to be desired, which is aggravated by the uncertainty related to the results of the forthcoming 2018 presidential election in Russia. Over the last 2 weeks, Brent oil has been going up in value. Despite a short-term drawdown seen last week, the overall bias is still bullish. In late October, Brent oil set a new local high by exceeding the $60/b threshold for the first time since July 2015. 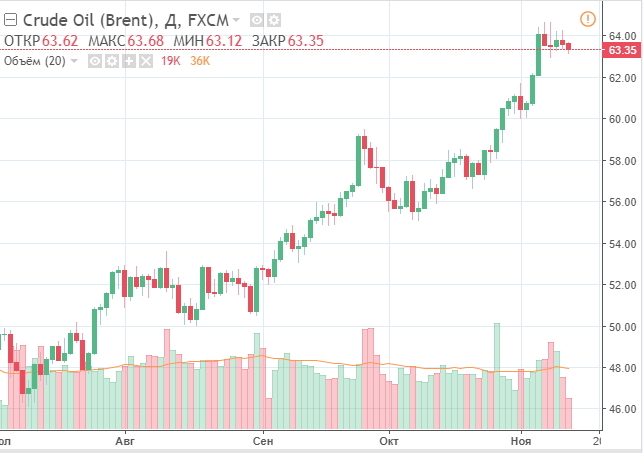 However, this somehow failed to back the Russian Ruble despite the fact that the Russian economy has always been heavily dependent on the export of crude oil, and any rally in the market of crude oil is supposed to favor the Russian Ruble to some extent. To be honest, the Rubble did manage to win some of the lost ground back by going down to 57,6 against the U.S. Dollar right in advance of the oil price record. But when the record was set, USD/RUB showed almost no reaction which is a wakeup call. Later on, when oil prices retraced, the Ruble went back to 59 against the U.S. Dollar. According to InstaForex experts, such miscorrelations between the 2 assets have been seen more and more frequently over the last few years. However, in theory, such a major rally seen in the market of crude oil should have triggered a certain reaction in the USD/RUB market. Therefore, they think that one of the key reasons for the Rubble showing no reaction to the oil rally boils down to a possible loss of interest by those traders who utilize the so-called “Carry Trade” strategy when trading Russian assets. As for the Central Bank of the Russian Federation, they have been cutting the key interest rates slowly but surely. This is something that clearly makes Ruble assets less attractive, especially against higher chances of the Fed’s tougher monetary policy. As a result, as predicted by some experts, the support coming from foreign traders can really play against the Russian central bank and the Ruble. As they are losing interest in Russian assets, Russian corporations are about to start paying external debt in December. Along with the new anti-Russian sanctions, all of that is clearly showing us that the situation is not in favor of the Russian Ruble.